ALBA Board members Antonio Muñoz Molina and John Sayles today shared the front page of El País, the most widely read newspaper of the Spanish-speaking world. Muñoz Molina, speaking at the Hay Festival in Segovia, criticized Spaniards’ lack of knowledge about their own past. 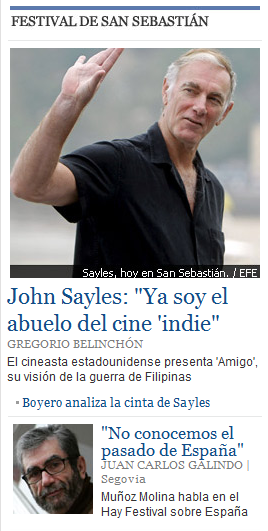 Sayles, meanwhile, screened his new film Amigo, about the Philippine War, at the San Sebastián Film Festival.